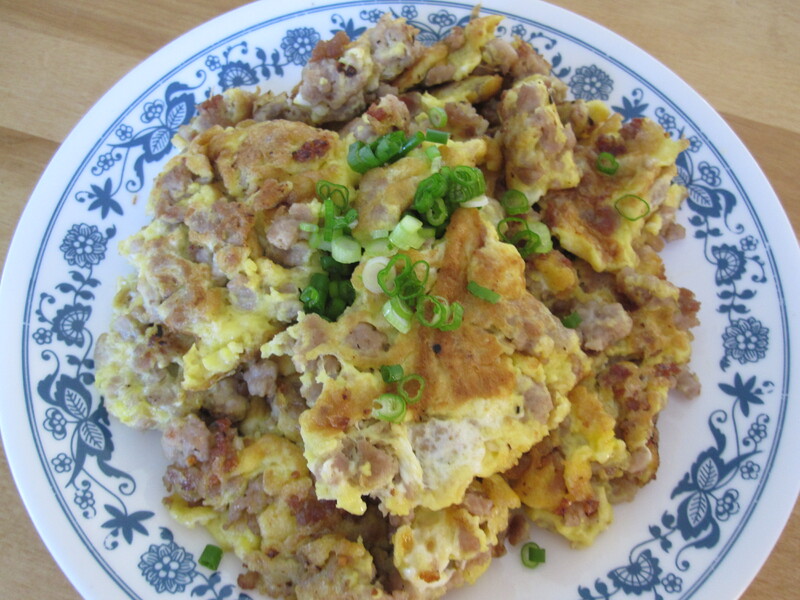 Ground Pork Omelet– a very simple homemade dish. It is one of my default dishes as we always have ground pork in the freezer, and one of Richard’s favorite dish too. I learn this recipe from my mom, but I add a lot more garlic as it adds more flavor to the dish. Season ground pork with the seasoning, or use your daily meat seasoning. Heat up wok and add some oil, saute garlic until aromatic then add in pork. Continue stirring to loose up the meat. Add seasoning to taste. Continue stirring until the meat is cooked. Pour beaten eggs over pork, pan fry until the bottom are golden brown. Turn omelet over to fry the top side. Dish out and garnish with green onion and/or cilantro. Served with steamed rice or plain porridge.